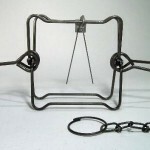 BODY GRIP 220 7" X 7"
TRAP DESCRIPTION: Bodygrip Traps are square, heavy steel traps which have two springs designed to hold strong animals. These springs are in the shape of a "V" and when set, compress the tops of each "V" together. There is a safety latch on each "V" so that once compressed, you can latch it to hold it safely set. Once both "V"'s are compressed, you set the key into the groove of the trigger. Now, place the trap where you want to make the set. Once in place, the safety latches are released and the Bodygrip is ready for it's target animal. Because of the strength required to compress these "V" springs, it is generally suggested that you get a pair of Setters for making the set. These will give you much needed leverage so the act of compressing the springs will be easier. This trap will kill target animals quickly. WHERE TO USE IT: Bodygrip traps can be set many different ways. The key to a good set is having the trap placed in the path of the target animal so it must attempt to pass through the trap. Such locations include holes in fences, deck trellis, crawl spaces or sheds. Funneling can also be used for armadillo when you know they are active in a certain area. Use 2×4's or other landscape timbers to create a bottleneck funnel which will force the target animal to pass through your set. These types are so effective you can get fast and easy control of local problems with hits happening every night. RATE OF APPLICATION: This will vary from job to job. Generally, the more traps employed, the quicker you catch your target animals. Although you can start with only one, it is suggested that you use 2-3 where you can and more if you have ten or more animals being targeted. Comments on BODY GRIP 220 7" X 7"
In the article you'll see mention of a trap stand. This is generally used to hold the trap upright so it can be placed in front of a hole you know they are using. But this trap holder is for making upright sets. In other words, its best for making sets in front of entrances which are horizontal to the ground. Such holes are usually on the side of a small hill or plateau. So for holes in the ground that go straight down, one can usually lay a 220 directly over the hole and then secure the trap by staking the "circle" base of each spring to the ground. One should also elevate the trap by placing a "spacer" in between the circle and the ground in such a way so as the ground hog exits their den, they'll be sticking their head directly into the trap and when the trap goes off, it will have enough clearance to compress over the ground hog unimpeded. In fact there are other sets that can be used if including the "bucket set". This one is good when you know where the animal is feeding, what they're eating, etc. 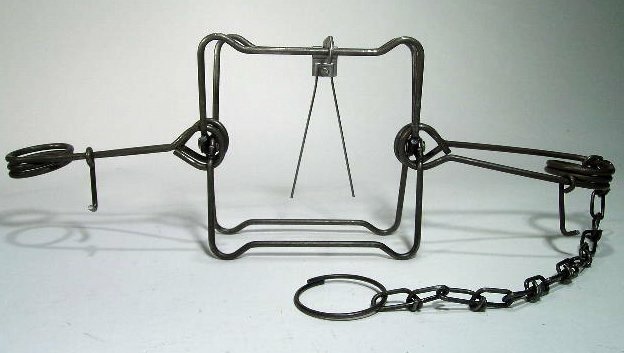 What size conibear body trap is best for catching and killing armadillos, 120, 220, 280 or 330 ? Generally the 220 is the smallest trap to use. Make the set using a couple of 2×6 planks (unless you have a small trail or pass through you know they're using) to "funnel" the animal to the set. Use our Trap Stand to make the set.